When does a ritual become abuse? NBC News covers how hazing has become part of the nation's college culture — and what action is being taken. Ryan Burke "decided to step forward at his earliest opportunity to acknowledge and accept his responsibility," his attorney said. "They must be held accountable for their individual actions," said Pennsylvania Attorney General Josh Shapiro. If it passes, hazing will become a felony that could carry a 7-year prison sentence in the state. Coffey, a junior and a pledge at Pi Kappa Phi, died of alcohol poisoning on Nov. 3 after he was found unresponsive after a party the night before. A grand jury report blamed Penn State University for allowing a lack of oversight, shoddy record-keeping and an accepted culture of underage drinking and hazing leading up to the death of Timothy Piazza. Officials at the State University of New York's College at Brockport say the students have been charged with such misdemeanors as hazing, assault, criminal nuisance and animal cruelty. The Ivy League university said in a statement Wednesday that it was "deeply troubled by the allegations." Fourteen more former fraternity members pleaded guilty to reduced charges and were sentenced to probation for the 2013 hazing death of a N.Y. college freshman. Indiana University’s student-run Interfraternity Council has voted to suspend all Greek life activities, the school announced Monday. Colleges are suspending Greek life. Don't expect the ban to last. At least four universities have banned campus Greek life following hazing accusations and alcohol-related deaths. But experts say Greek life is too valuable to lose. A spokesman for the university told the student newspaper, The Lantern, that most of those 11 investigations involve hazing and alcohol. The death of Matthew Ellis, a sophomore Phi Kappa Psi fraternity pledge, may have been alcohol-related. The district attorney is charging 12 additional fraternity brothers in the death of Tim Piazza after the FBI recovered deleted surveillance video showing the freshman being given 18 drinks in a little under 90 minutes. 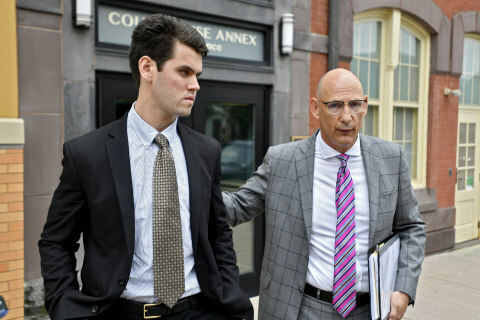 The Centre County District Attorney said the video confirms that pledge Timothy Piazza was given 18 drinks in just over one hour and 22 minutes. The charter for the Beta Eta chapter was revoked for allegedly violating social events policies. Andrew Coffey, a 20-year old junior, died Nov. 3. The University of Michigan’s Interfraternity Council has suspended all Greek Life activities following allegations of sexual assault, hazing and drug use. The students were found to have violated the Student Code of Conduct in connection with the death of Timothy Piazza, 19. Fraternities and sororities have been suspended at FSU after an apparent alcohol-related death of a pledge and, separately, the arrest of a frat member on cocaine charges. The 10 arrests in connection with the death of fraternity pledge Maxwell Gruver came after Phi Delta Theta formally suspended the LSU chapter. 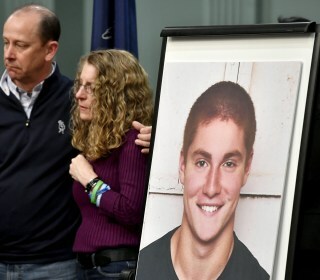 Penn State officials are now grappling with another alcohol-fueled incident about eight months after a pledge died after falling at a fraternity party. NBC News is taking a closer look at hazing in America to shine a spotlight on this dangerous behavior and a culture that advocates say must change. Interactive: Where Hazing Is a Crime in the U.S.
As universities and colleges work to combat hazing in campuses across America, laws treating hazing as a crime vary from state to state. American University expelled 18 students associated with an underground fraternity in a move that experts on hazing said was unheard of. Phi Delta Theta member and Louisiana State University freshman Michael Gruver died with a "highly elevated" blood alcohol level. 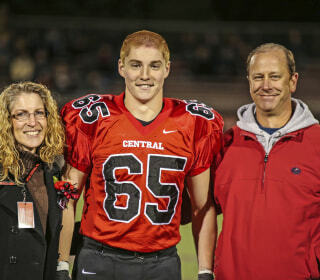 Do Penn State's Reforms After Hazing Death of Timothy Piazza Go Far Enough? The changes come exactly four months a 19-year-old sophomore was involved in alleged heavy drinking at a pledge event.